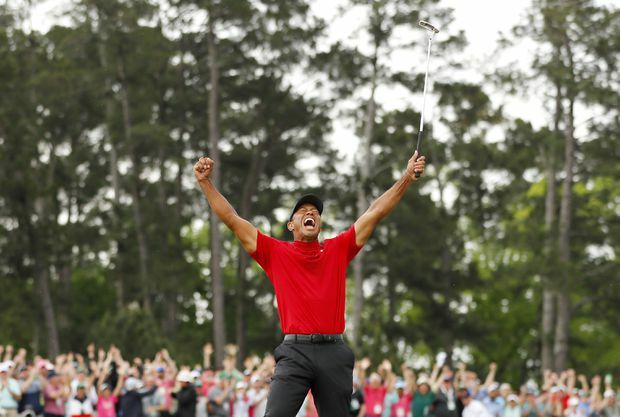 Tiger Woods celebrates after sinking his putt on the 18th green to win the Masters at Augusta National Golf Club on April 14, 2019. “There’s nothing I can look forward to, nothing I can build towards,” Mr. Woods said as his back problems worsened in 2015. Perhaps the most recognizable athlete of this century, Mr. Woods, 43, had become more famous for projecting misery than anything he’d won. It was getting hard to remember when he’d last looked happy. In what may be the most unlikely career arc in sports history, Mr. Woods won golf’s most prestigious event, the Masters, for the fifth time. It had been 14 years since he’d last won in Augusta, Ga. It’s been 11 years since he’d taken one of golf’s major tournaments. 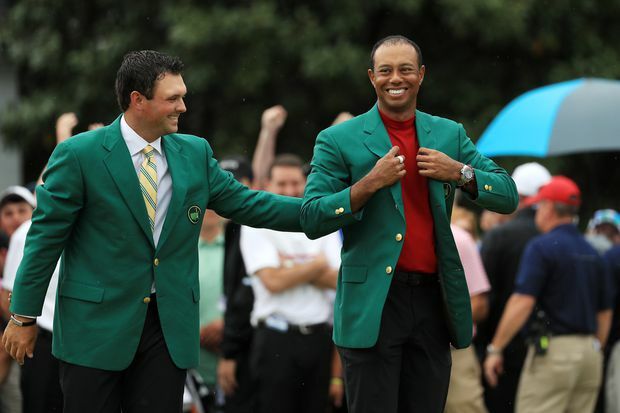 Tiger Woods is awarded the green jacket by former Masters champion Patrick Reed at Augusta National Golf Club on April 14, 2019. Like the many millions of us who’d been watching, he also seemed surprised by how the day was ending. Since last winning a major, his personal life imploded. His back began to disintegrate. He entered rehab for addiction to prescription painkillers. He had surgeries, plural. What he didn’t do a whole lot of was golf. In middle age, Mr. Woods had become a human branding exercise – not good enough to compete with the best, but still too successful a product salesman to give up. If you were up for the prelims, you got a small taste of the tone in the early going. CBS announcer Jim Nantz did a softball retrospective with analyst and former Masters champ Nick Faldo. Mr. Nantz is no Barbara Walters, but he got Mr. Faldo tripping down memory lane and Mr. Faldo began to weep. At the start, Mr. Woods trailed Italian Francesco Molinari – a man as emotionally flat as a carp – by two shots. The lead group “plodded” forward – that was Mr. Woods’s word – hovering at par. Others began to come up behind them. At points, a dozen were within close range of the lead. Mr. Woods didn’t win the race at the 12th hole, but just about everyone else lost. Four of six golfers in the two leading groups found the creek. All four double-bogeyed. Mr. Woods stroked one in to safety, and that was it. He knew it, but showed nothing. The cocky, care-free kid we remember is dead. There’s a beaten-up, but apparently not beaten-down, man in his place. Mr. Woods took the sole lead at the 15th. At the par-three 16, he feathered one off the tee to within inches of the hole. That’s when the crowd bought in. From that point on, it was a parade. He won the Masters by a single shot. There was the usual skyward howling and embraces. What was unusual was the reaction of the crowd. The mob around the 18th green was frothing, chanting, close to hysteria. Augusta National is in the United States, but not really part of it. It’s too urbane. But this was a very American moment – the big man brought low and then raised up again, reminding all the little people that, under the Stars and Stripes, that’s still possible. It’s the Nathaniel Hawthorne quote: “Families are always rising and falling in America.” Few citizens of the republic have lived that line to greater extremes than Tiger Woods. As he was still finishing off his day’s work, Mr. Woods was already being welcomed back at the front of the pack. All his opponents bent the knee without being asked. It felt less like your usual triumph and more like the Roman sort, in which a whole city came out to celebrate a conquering hero. Top finishers, former winners and Augusta National members lined the path to the Butler Cabin, just as desperate as fans to touch the great man. They didn’t used to do that when Mr. Woods was in ascendancy. You realized this wasn’t nostalgia. It’s time travel. We’re in 1997 again. Get ready for Tiger Watch, Tigermania and a whole lot of tiger metaphors where they don’t belong. This go-round, it’s not the fun, first-tech-boom, we-won-the-Cold-War, nobody-hates-people-who-don’t-agree-with-them era a few Americans must still remember. Mr. Woods must have known the sort of catharsis people wanted. Something like, ‘It was so terrible, but it was all worth it’. But he wouldn’t give it to them. He kept insisting on talking about the golf. Everyone still gushed like he was speaking poetry. And it’s possible this version of Mr. Woods is the perfect sporting hero for the age. Brilliant, compromised, fragile, a little bitter. A man who has been to the other side, and has come back determined never to return there. 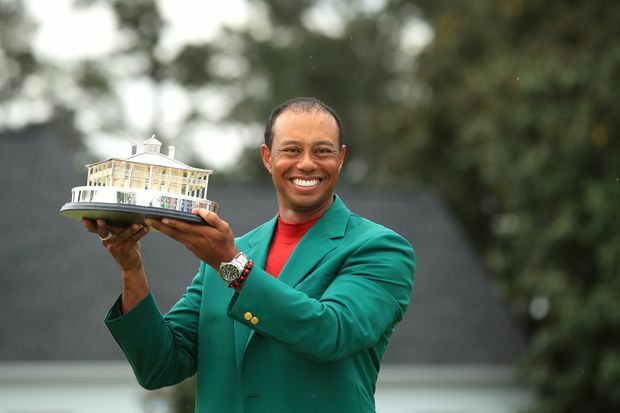 Tiger Woods celebrates with the Masters Trophy during the Green Jacket Ceremony on April 14, 2019 in Augusta, Georgia.